If you haven’t bought your tickets yet for Charm at Mosaic Theater Company, you should. 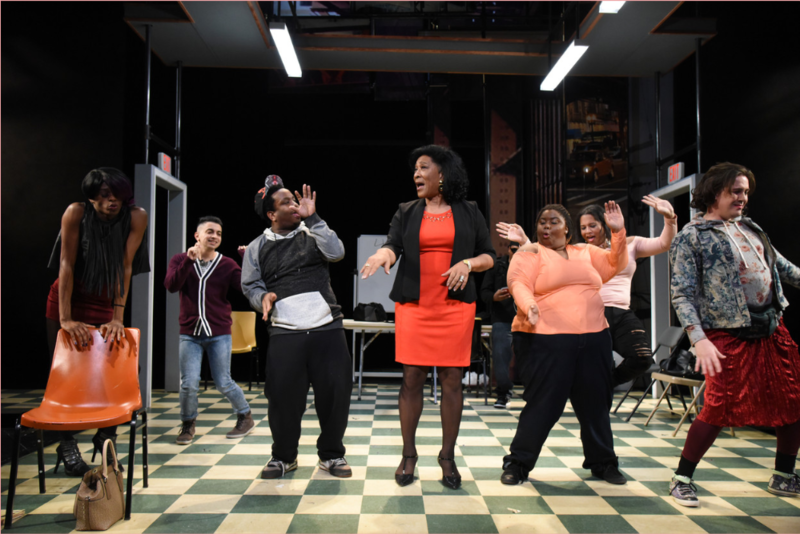 This revolutionary play got its start at the award-winning Northlight Theatre in Chicago in 2015 is now playing in D.C. through January 29. We sat down with playwright Philip Dawkins to get the inside scoop on his process writing this incredible piece of theater. Justin Weaks as Jonelle (center). L to R: Joe Brack as Lady, Jade Jones as Victoria, Nyla Rose as Ariella, Clayton Pelham Jr. as Beta, and Samy El-Noury as Logan. Photo copyright Stan Barouh. When you first came across the real-life story of Chicago trans icon “Mama” Gloria Allen, what struck you about her story that you had to write about her? Philip Dawkins: It was (Northlight Artistic Director) B.J. Jones who came across Gloria’s story and decided it needed to be put on the stage. He brought the story to me, and I agreed, but I immediately thought it was a story for a different playwright. It wasn’t until I met with Gloria that I felt how much we had in common. It should probably be noted that Gloria thought it would be a good play. She’s amazing, and she knows the power of her role and isn’t afraid to admit that her work and her life should reach as many people as possible. She’s seen the change she’s affected in so many people’s lives, and it only makes sense that she’d want her story to go out over any platform that could continue affecting that positive change, and growing the community. Theater, as we know, can absolutely do that. I think, though, I knew that I had to do it when Gloria looked at me and said, “Write this play.” Hard to argue with that. B’Ellana Duquesne as Mama, Clayton Pelham Jr. as Beta, and Nyla Rose as Ariella. Photo copyright Stan Barouh. I know that as research for Charm you actually spent 6 months in Mama Gloria’s Charm School. Why was that a necessary step of the process for you, and specifically for such an extended period of time? Oh my goodness, it was essential! I’d never written a play inspired by real people who were still very much alive. As a playwright, I LIVE for opportunities like that. All of the people were right there in front of me and could talk to me, and correct me when I got it right, and snap when I got it right, and wrinkle their brows when they weren’t sure. I needed everyone’s involvement and input because it’s their story. 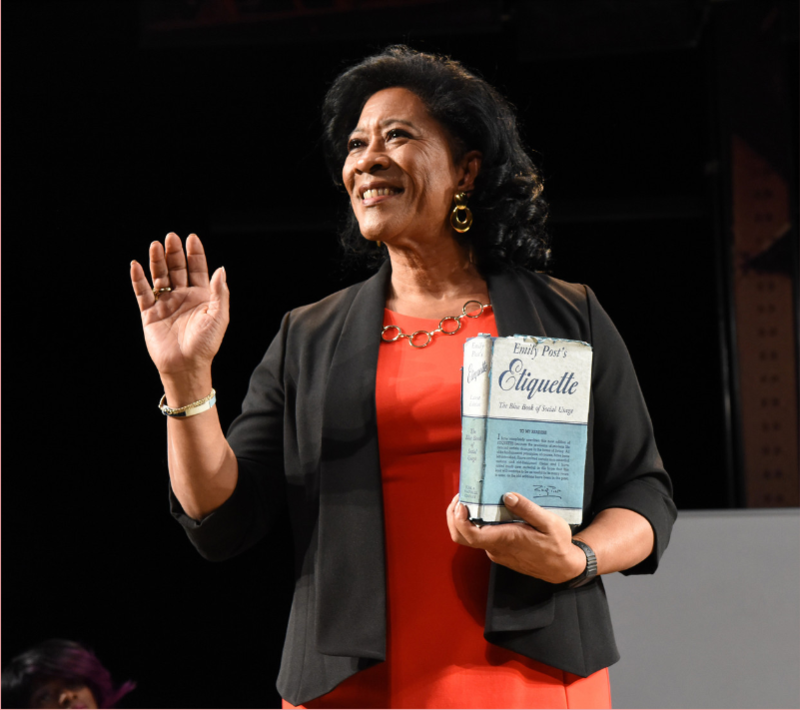 As a playwright, I think it’s my job to get out of the way as much as possible and organize the stories and characters in a way that audiences come as close as possible to having the experience that I had, that of being in the room with the people in the play. B’Ellana Duquesne as Mama (center) and members of the ensemble. Photo copyright Stan Barouh. 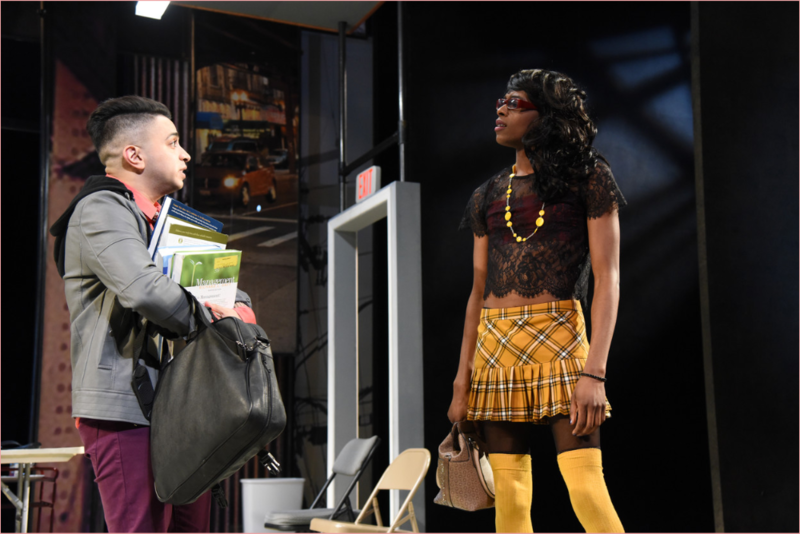 Mosaic Theater Company made headlines last week with the announcement that B’Ellana Duquesne, a transgender woman, was taking over the lead role of Mama Darleena Andrews from the originally cast KenYatta Rogers, a cisgender man. As trans representation in the media has been on the rise over the last few years, conversations about authorship and casting have been quick to follow. What’s your take on casting trans roles? 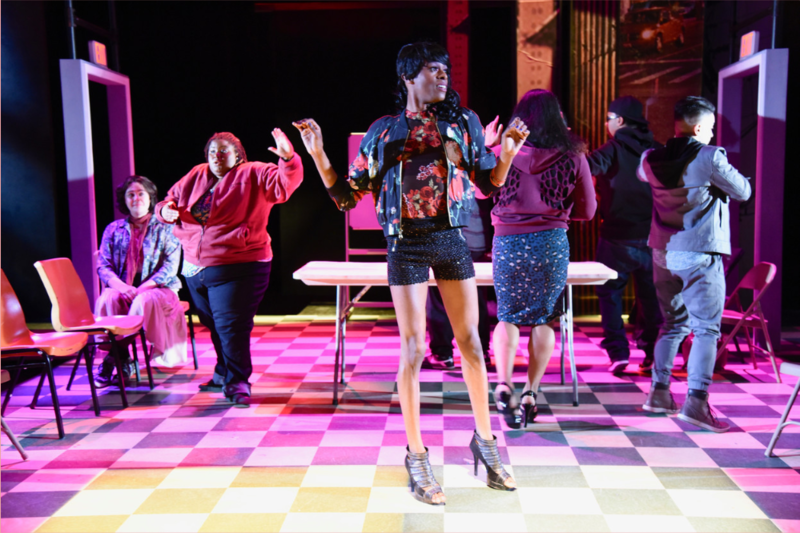 [T]he desire from the beginning was to find a trans woman of color in her sixties to play Mama. That person is someone who, let’s just say it, has not traditionally been nurtured by the American Theater, and that makes finding her difficult. Luckily difficult is not impossible. I don’t know KenYatta, but he has my endless respect for doing his research and then admitting that this was really someone else’s opportunity. I do think it’s about representation. If there is a trans role, every effort should be made to cast a trans person in that role. Same for roles for the elderly and for people of color, and people with disabilities. We have some repairing to do in the American Theater, because so often the people with the lived bodily experience of many characters weren’t even considered for these roles (not always, but often), and so they were pushed away from opportunities to train them in their craft. I’ve been informed that for some of the actors in previous Charm productions, this play awarded them either their first or their largest roles, and that makes me happy. And I know it makes Mama Gloria proud as well. Samy El-Noury as Logan and Justin Weaks as Jonelle. Photo copyright Stan Barouh. What do you find to be the most salient takeaway from the play in today’s political landscape? Empathy. We are experiencing and empathy drought in this country. It’s dangerous and it’s terrifying. But it can be changed. The goal of Charm the play as well as charm the concept is to create opportunities to exercise radical empathy. Charm is about making sure everyone (excluding no one) feels welcomed. B’Ellana Duquesne as Mama. Photo copyright Stan Barouh. And finally, how have your manners improved since writing a play about etiquette? Ha! I imagine they’ve gotten worse. I don’t have a ton of patience for decorum for decorum’s sake. [B]ut now I see these occasions as places where people are all engaging in behavior that helps make the most amount of people in the room feel comfortable. And, as long as it’s not compromising any of my principles, I can certainly engage in the act of trying to make everyone comfortable. Then, immediately after that, I can leave, take my tie off, get blasted, and binge-eat Dairy Queen on a curb with my friends. 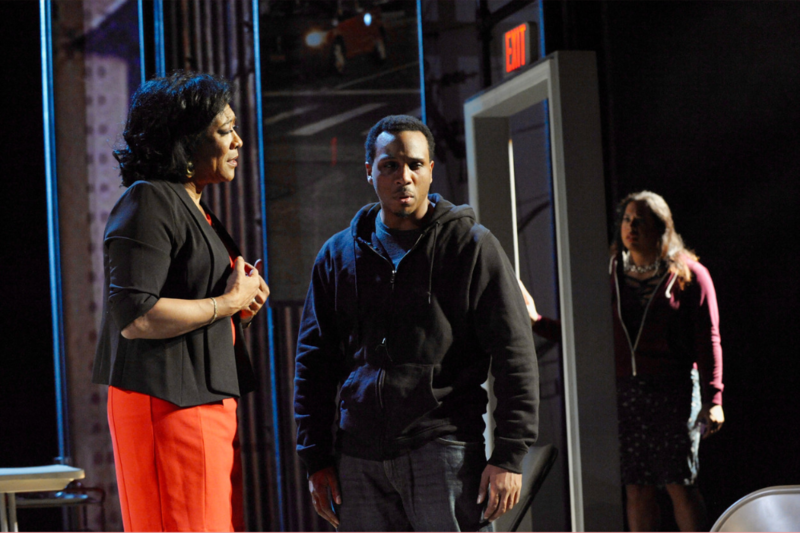 Check out Charm at Mosaic Theater Company and download TodayTix to unlock $12 Rush tickets.